I had really loved Ender’s Game when I read it a few months ago, and then was immediately put off a bit once I learned a bit about Card’s politics and ethics. I decided to try this book anyways, and tried to be really conscious of how my enjoyment of the book might be affected by my feelings for the author. I tried to enjoy it, I did, but just could not. 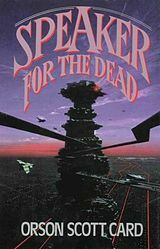 Orson Scott Card’s Speaker for the Dead is set some thousands of years after the events in Ender’s Game, and is set mainly on a planet called Lusitania, where a small colony of human live and observe the native species. The Pequeninos, commonly called the piggies, are a sentient species, the first humanity has found since expanding throughout the galaxy after the genocide of the Formics. It is a strange planet, with a very limited and mysterious ecosystem, and the people living there are basically prisoners and abide by a version of Star Trek’s Prime Directive (nerd). There is a virus on the planet that killed many of the humans, until the biologists living on the planet are able to save people from death. One cold and intense young girl experiences a series of tragedies, and calls out to the other worlds for a Speaker of the Dead, someone who relates the truth of a dead person to those left behind. Through the mysteries of space, the Speaker that is called just happens to be the original Speaker – Ender Wiggin. It is a really, really long set up before any action starts in the book, and it is genuinely kind of boring. Even the surprise reveal near the end doesn’t feel particularly surprising or exciting. The new characters introduced on Lusitania are generally unlikeable and cliche, and Card even manages to rob Ender of the sense of danger and innocence that made hims so appealing in Ender’s Game. The whole novel seems kind of fraught with a heavy handed agenda and an eye on another sequel. Maybe this novel would be better if I could put it in the context of the larger world developed by Card, but I don’t think I am eager to look into the others at this point.